What to See and Do in Mexico City in 2 days…for Free! Step one, stop being afraid of Mexico City! Despite the fact that many of your friends and family will consider it one of the most dangerous cities in the world, you’ll soon discover otherwise. With a population of over 22 million people it definitely has its share of crime but with basic precautions you can make sure you’re not a part of it. Before arriving in Mexico City for my first time, my friends, coworkers and family had warned me to “not get kidnapped”, “not get murdered” and in general “come back alive”. For the most part, people thought that visiting Mexico City for recreation was an insane thing to do. In my opinion, this couldn’t be further from the truth. 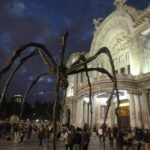 So if you’re only in Mexico City for a few days (two or three), here are some of the top sites and attractions to check out. I know this information would have helped me, rather than sifting through endless pages in guide books. I have purposely excluded museums because if you’ve traveled all this way, and only have a few days, why spend them inside. Zolaco: As stated above it is the main square and the center of gravity for all sites within the Central Historico. Palacio National: Home of the office of the president of Mexico and the Federal Treasury. However the first palace on this site was actually built by an Aztec emperor in the 16th century. Templo Mayor: Excavated in 1978, the temple is believed to be the exact spot where the Aztecs saw their symbolic eagle perched on a cactus…which is in their belief system, the center of the universe. Catedral Metropolitana: This is probably Mexico City’s most iconic structure. Siting on the north end of the Zolaco, you can’t miss it. Alameda Central Park: Located between Av Juarez and Av Hidalgo is the Alameda Central Park which is a nice enough spot to take a break from all the walking around in the Centro Historico. Palacio de Bellas Artes: An interesting palace that is now an arts center and concert hall. Also known as the “Pink Zone”, it was originally set up as an international enclave but has since declined slightly and now is the epicenter for Mexico City nightlife. It hosts numerous bars, discos, strip clubs and restaurants and is also home to the cities’ gay scene. This is Mexico City’s largest park covering 4 square km and home to a zoo, two lakes and several museums. It is a popular spot for families on the weekends and a nice place to take a stroll. This is the most bohemian neighborhood in Mexico City and home to numerous writers and artists. Here you will find a lot of hip bars and coffee shops scattered along the nicely manicured tree lined streets. It may not be much of a tourist attraction in its own right but it is a significant aspect to the city. The Paseo de la Reforma is a main artery that cuts southwest across the city. It hosts numerous monuments and the cities more upscale hotels and office buildings. You can’t miss it. Ohhhh, so you’ve got 3 days?? Well, on that 3rd day you should take a short day trip outside the city to see the pyramids of Teotihuacan. Located 50 km (about 1 hour) northeast of Mexico City is the regions’ number one draw. Here you’ll find the remains of what was once Mesoamerica’s greatest city and the capital of Mexico’s largest pre-Hispanic empire, the Teotihuacan Pyramids. Two pyramids dominate the landscape; the Piramide del Sol and the Piramide de la Luna.